In Part 1, I mentioned that 1997 was the year of the tribute record, but there was one death I omitted to mention: the demise of grunge. By 1997, bands like Alice In Chains, Soundgarden and Stone Temple Pilots were all on hiatus or broken up and genres like R&B, rap, dance and pop were flourishing. One of the biggest pop groups of 1997 was Hanson, who placed three songs in the top 15 highest-selling singles in Australia for the year. 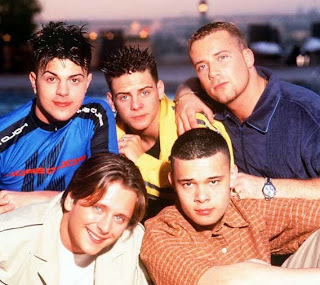 In the UK, boy bands and girl groups were sprouting at an unstoppable rate, with many following the lead of Take That and Spice Girls and breaking internationally. Meanwhile, artists like Az Yet, En Vogue, Warren G, Babyface, Keith Sweat and Babyface finally toppled Australia's traditional resistance to rap and R&B music, making the ARIA top 50 the most diverse it had ever been. Instrumental track "Offshore" had been the debut single for Chicane (real name: Nicholas Bracegirdle) in 1996, but in a move we'd see again and again over the coming years, the song was given a new lease of life when the track was combined with vocals from the Power Circle track "A Little Love A Little Life". What started out as a bootleg mash-up by Australian DJ Anthony Pappa was given the official go-ahead and "Offshore 97" was released for public consumption. That wouldn't always be the case, with many unofficial mash-ups failing to receive the necessary approvals to be given a commercial release. Here's one of those girl groups I was talking about - and over the coming years All Saints would rival Spice Girls as the UK's favourite all-female combo, with a string of number 1 singles and headline-grabbing antics thanks mostly to Appleton sisters Nicole and Natalie. Interestingly enough, the Appletons weren't originally in All Saints, with the line-up initially consisting of Melanie Blatt, Shaznay Lewis and Simone Rainford, and going by the name of All Saints 1.9.7.5. Simone eventually left the group and the Canadian-born Appletons joined the renamed band. "I Know Where It's At" was the first single by the quartet, and both it and follow-up "Never Ever" (number 98 on this list) quickly establish All Saints as a pop force to be reckoned with. In 1997, movie soundtracks were still a big thing - and there was no film tie-in bigger than the album for Romeo + Juliet. OK, maybe the Titanic soundtrack was officially more successful, but the Romeo + Juliet album definitely had more cred. Alongside cool rock bands like Garbage, Radiohead and Everclear, were some pure pop tracks, like this cover of the 1976 disco hit by Candi Station (who we'll see later in this countdown). For Kym Mazelle, it was her biggest solo single after years of club hits, guest vocal appearances and collaborations. This dance track narrowly missed my top 100 for 1993 but was revived four years later for a remix that not only made the song better, but also improved its UK chart fortunes (the original had hit number 25, this remix made number 14). The British group was renamed Staxx Of Joy for the US, while vocalist Carol Leeming (who'd also appeared on Trainspotting track "For What You Dream Of" with Bedrock) received a credit this time around. Two things I didn't know about British soul singer Shola Ama until now. One, she was a teenager when her cover version of the Randy Crawford hit from 1981 was a success in the UK, and two, her real name is Mathurin Campbell. "You Might Need Somebody" was Shola's second major label release and kicked off a couple of huge years, which included a multi-platinum album and a BRIT Award. The song that saved Robbie Williams' solo career, "Angels" was the chart hit he desperately needed in the UK after his previous single, "South Of The Border", had missed the top 10 and sales of his album, Life Thru A Lens, had disappointed. Never rising above number 4 in the UK, "Angels" spent 12 weeks inside the fast-moving UK top 10 and remains the highest-selling single of his career. The song wasn't as successful in Australia, where it finally reached number 40 on its third release at the end of 1999, or the US, where it stalled at number 53 around the same time. A true one-hit wonder now, The Blue Boy (aka Scottish DJ Lex Blackmore) made liberal use of Marlena Shaw's "Woman Of The Ghetto" for this club track - the key samples can be heard at the 1:25 mark and the 8:30 mark. This wasn't the only example of an obscure record being made use of by dance acts in the late '90s, with both Moby and Fatboy Slim finding vocal hooks in long-forgotten soul and gospel tracks. So while pop was making a comeback in 1997, one of the biggest pop stars on the late '80s and early '90s went against the flow with the release of her Impossible Princess album. Following her hit collaboration with Nick Cave in 1995, Kylie embraced indie sounds and even drafted in two members of Manic Street Preachers to co-write the album's lead single "Some Kind Of Bliss" (number 33 on this list). I've talked about that song elsewhere, and although I prefer it to this follow-up, "Did It Again" was actually the bigger hit, returning Kylie to the Australian and UK top 20 after "Some Kind Of Bliss" had spectacularly bombed out. 1997 was the year UK garage crossed over from the underground to the mainstream with songs like this 2-step classic and Rosie Gaines' "Closer Than Close" (number 145 on this list) proving to be significant and enduring chart hits. Originally released in quite a different version in 1995, "Never Gonna Let You Go" was overhauled by Kelly G and Tuff Jam, their remixes spawning a raft of imitators over the coming years. Or 5ive, if you insist. Put together by the same management team that'd formed Spice Girls, Five were the greatest beneficiaries of the absence of Take That and East 17 from the UK charts in 1997. Combining East 17's bad boy approach with Take That's pop sensibilities, Five were signed by Simon Cowell and debuted with this track, co-written and co-produced by Swedish maestros Max Martin and Denniz Pop. "Slam Dunk (Da Funk)" only just made the UK top 10, but it was just the beginning of a huge success story. Time for another vocal house track that's only on YouTube in extended mixes I don't like. The version that was most prominent in Australia was the Dancin' Divaz mix, which was edited for the local CD single release and appeared on one of the excellent Wild FM compilations. A cover of a little-known 1988 soul track by singer Gwen McCrae (whose biggest claim to fame was a top 10 hit in the US in 1975 with "Rockin' Chair"), this house version featured vocals by Mary Pearce, who we saw back in Part 1 on the Up Yer Ronson track. The singles continued from George's Older album in 1997, with two of them, this song and "The Strangest Thing 97" (number 177 on this list with double A-side "You Have Been Loved") receiving a substantial remix from the album version. As far as "Star People" was concerned, it was a remix of a remix that was most popular - with the Forthright mix (below), gaining most attention. I'm not sure if there was a music video released for this track - I don't recall seeing one and I can't find it online if there was. And now, a vocal house diva who actually manages more than one appearance on this list. Michelle was the vocalist of Bobby D'Ambrosio's "Moment Of My Life" (number 94 on this list) and appears here in her own right with a track on the Ministry Of Sound record label, which had been launched in 1995 and is one of the few examples of a nightclub spin-off project lasting the distance. Who would have predicted back in 1992 when Tori debuted with Little Earthquakes that five years later she'd be involved in one of the biggest dance hits of the year? Granted, in the radical reworking her 1996 single "Professional Widow" received, she'd be all but removed from the song, but she was obviously happy enough with the result to call and thank remixer Armand van Helden. The remix was present on the original release of the song, but six months later, it was elevated to the main mix on a re-release and shot to number 1 in the UK. It would also be her biggest single here in Australia, beating the number 19 peak of "Cornflake Girl" by two spots. A band that just about everyone had forgotten about by 1997 staged an impressive comeback with the White On Blonde album, and although I wasn't a fan of lead single "Say What You Want", I did enjoy this third single which sounded nothing like the pop/rock sound for which the Scottish band had been known. Well, when I say "known for", aside from debut hit "I Don't Want A Lover", can anyone name another Texas single from their first three albums? In Part 3, a UK band makes an unexpected comeback, a global superstar enjoys his final big hit and there might just be the odd dance track or two. Before that, we'll check back in with all the ARIA chart action from 25 years ago.